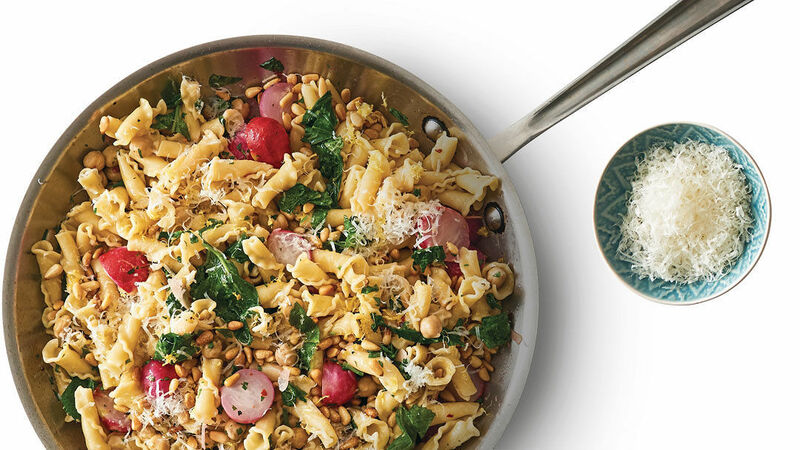 This Mediterranean-influenced pasta is easy and delicious. Salting the radishes before cooking is the key to bringing out their lovely flavor. Put the radishes in a medium bowl, and toss with 3/4 tsp. salt and 1/4 tsp. pepper. Meanwhile, cook the pasta according to package directions until al dente. Reserve 1/2 cup of the cooking water, then drain. In a large deep skillet, heat the 1/4 cup of oil over medium heat until shimmering. Add the radishes and cook, stirring occasionally, until beginning to turn golden, about 5 minutes. Reduce the heat to medium low, and add the radish leaves and stems, garlic, and pepper flakes, and cook, stirring frequently, until the garlic is fragrant and the greens are wilted, about 2 minutes. Add the chickpeas, parsley, and pasta. Stir to coat and heat through. Remove from the heat, and add the reserved cooking water a little at a time to loosen the sauce, if you like. Season to taste with salt and pepper. Stir in the lemon zest and juice, pine nuts, and the 1/4 cup of cheese. Drizzle with oil, and serve with more cheese at the table.